Here you can see some flaws in the image that will remain untouched. The ‘hairs’ visible on the top and bottom of the second image are actually instances of dirt and dust in the gate of the camera itself, and were permanently printed onto the image while shooting. A lack of cropping here allows us to see a great deal of new detail on each side, dirt included. The often awkward framing in theatrical prints seems to be the result of lab work that cropped for the academy aspect ratio, although the film itself is clearly composed for the full- frame ‘silent’ ratio. This was likely due to a lack of academy frame guides in the viewfinder of the (silent) cameras used. 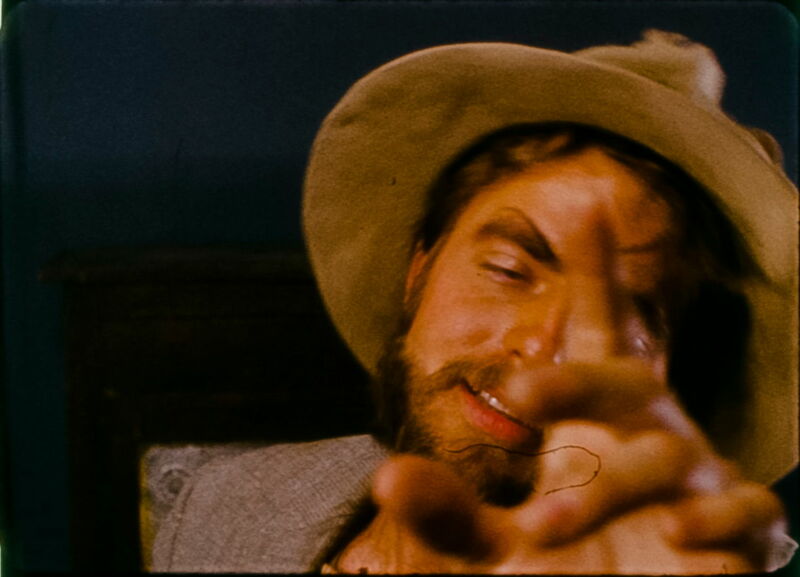 We will be presenting Manos for the first time with the entire image area visible, as the director of photography saw it in 1966. This shot, like many others in the film, is out of focus. There is no technology in existence, then or now, that can bring a soft shot back into focus, nor is it within the goals of the restoration to do so. As usual, color correction is not final. This entry was posted in 2k, Comparisons and tagged 2k, Damage, Margaret, Michael. Bookmark the permalink. I always loved the before-and-after comparisons on Criterion’s clean-up jobs; this is even better. Thanks for this ongoing look at the hard work going into the restoration. That’s great; we don’t want it looking “too pretty,” or it won’t be the terrible old Manos we all know and love! Adobe released a plugin a while back – DeBlur – that supposedly sharpens up photographs that are out of focus, although I doubt it would help much in this case. There’s another piece of software called Focus Magic that does the same thing. My guess is that neither of them would work very well with an imagine that has lots of grain, and of course Manos is one of those films that wouldn’t really benefit from pin-sharp images. Every shot looks like etc.